Your videos deserve the best. Enjoy the powerful tools trusted by professionals around the world. Video tools for every step of the way. Upload from all your devices (and your cloud storage platforms) to host and stream in 4K Ultra HD. Thanks to tons of powerful features, it’s never been easier to organize, share, and manage your videos. Host your videos in the highest quality possible, and stream in 4K Ultra HD. Easily organize, share, and make bulk changes to everything from embed settings to licensing. Flexible storage options means you never need to worry about running out of space. Choose just who can (or can’t) see your videos with privacy options. Upload to Vimeo from your computer, mobile device, or favorite cloud storage platform. 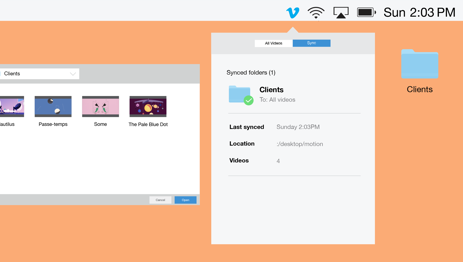 Use the Vimeo app for iOS and Android to back up your videos and watch offline. Upload in up to 8K, watch offline, and boost your skills with 360 Video School. Let your viewers speed up or slow down your videos when you enable speed controls. We’ll never put ads before, during, after, or on on top your videos. Automatically save and seamlessly compare versions of your videos. Streamline your workflow and make collaboration simple with video review tools (for unlimited reviewers), private sharing, integrations with Adobe Premiere Pro and Final Cut Pro, and more. Keep your videos private with custom password protection. Exchange time-coded notes and reply in real time to collaborate on rough cuts. Upload videos and launch review pages, straight from Adobe Premiere Pro. Add up to 10 team members to collaborate on private projects within your account. Upload videos, adjust privacy, and share links right from your desktop. Export to Vimeo in advanced codecs without leaving Final Cut Pro. Embed your videos anywhere, sell them worldwide, and even start your own subscription network. Engage your audience and optimize your videos with in-depth marketing and analytics tools. Customize the look of the video player with your colors or logo. Set domain- and geo-level restrictions to control where your videos can be seen. Launch your own subscription service, or sell your videos in a global marketplace (including 360). Create embeddable playlists or a customizable album to showcase collections of videos. Use third-party players to showcase your videos. Show more videos, play an infinite loop, and more: choose what happens when your video ends. End videos with a clickable button to send viewers exactly where you want them to go. Add email capture to your videos to generate quality leads from viewers and fans. Link viewers to any destination from any point in your videos. Sync captured emails with MailChimp, Infusionsoft, Constant Contact, or Campaign Monitor. Track performance and optimize your videos with in-depth stats. Get the power of Google Analytics for custom dashboards and insights. See exactly where viewers are watching, and where they’re dropping off. Debut online, enjoy dedicated PR and marketing support, and get global exposure. Distribute your videos across devices to 240M+ creators, viewers, and fans. Publish videos as native posts on your social accounts and track stats right from Vimeo. With Vimeo Live, you can live stream in full HD 1080p, get reliable tools to drive viewer engagement (and reduce stress), and do it all from one seamless video home — built for all your live and uploaded videos. Ensure your viewers get higher quality, while you get more flexibility and save dollars. Get email responses within one hour (weekdays), and chat support (U.S. business hours). Review and publish post-event videos, and edit and replace the file as many times you need. Live stream up to three events at once, so you’ve got coverage for all your happenings. Stream to unlimited viewers with zero overages, and get straightforward, inclusive pricing. Extend your reach by simultaneously live streaming to Vimeo and Facebook, YouTube, or other RTMP destinations. Get key insights from Vimeo, Facebook Live, and YouTube — all by channel, all in one place. Learn more about the latest updates and releases. 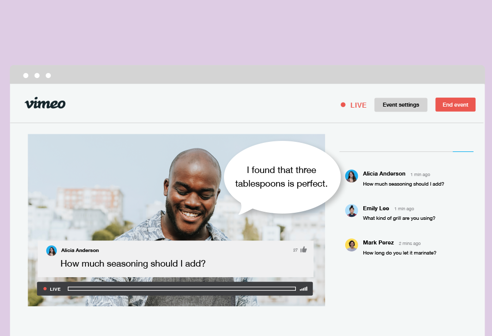 Live Q&A is a simple, effective way to get a conversation going with the people watching your live events. 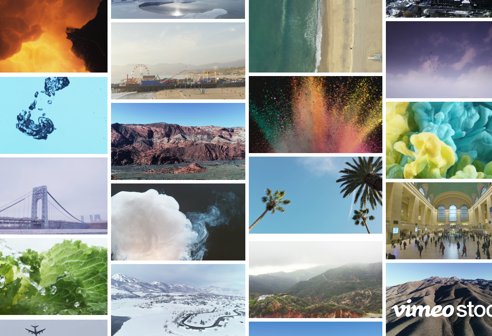 Find the Vimeo that’s right for you. To learn more about our powerful products for creators, browse our FAQ, or visit the Help Center to contact our friendly and 100% human support team.